[The next-gen LS] will also form the basis of the brand’s all-new LC Coupe and goes by the internal name LF-S II-FCV. This signifies the fact Lexus’ new range-topper will be available with fuel cell power, at least in some markets. The new LS line-up will also feature a 3.5 litre V6 petrol-electric hybrid variant pumping out around 330kW. 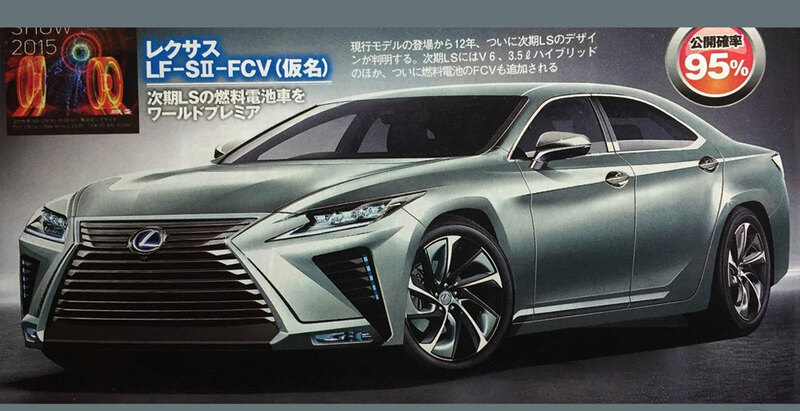 Unlike the production Mirai fuel cell car, our sources say the new LS FCV will incorporate all-wheel drive, but whether Lexus will reveal this news at Tokyo is unclear. The information from Best Car also included the rendering above, which has the LS taking on a very sleek profile while incorporating the front grille of the new LX, the wheels from the new RX, and the fender side vents of the Toyota Mirai. Dreski: LF-LC at Tokyo M.S. LS probably is not coming anytime within this decade.